The LG Arena comes with 8GB of internal memory and of course it's expandable via the microSD memory card slot. Hot-swapping a memory card is easy, but the slot is under the battery cover. We can also confirm that 8GB and 16GB microSD cards worked fine on our unit. The LG KM900 Arena file manager appears as the My Stuff item in the menu. It includes separate factory-preset folders, but you may put various content in them. File browsing is generally fast even when your memory card has a lot of images on it (800+ in our case). The files on the main storage and the external memory can't be browsed together as you could on some previous LG handsets. And that's a good thing, because it eliminates the problem of always seeing the files from the microSD before all others. LG Arena offers two gallery modes depending on the handset's orientation. In portrait mode images and videos are displayed in a grid sorted by date, type or name, while in landscape mode one image is displayed in the center and two more by its side in an impressive 3D spatial view. Did somebody say Cover Flow? Yes, the layout is quite similar to the Apple iPhone Cover Flow album art browsing, but let us remind you that the iPhone only offers that view mode in its iPod music player. As the LG KM900 Arena supports multi-touch you can zoom in on images with the pinching gesture made famous by the iPhone. Apart from the standard options such as rename, delete, print, send and info, there is also a slideshow mode. You can choose the time interval and the display order (shuffle or not). The nice transition effects are random, though we couldn't find an option just for them. Finally the "star" button is also here for creating picture shortcuts on the multimedia homescreen. The LG KM900 Arena music player is accessible both from the Cube interface as well as from the main menu. The Cube-accessed music player is rather basic but it does offer quick access to your tunes. The individual music tracks are displayed on a rotating reel and get visualized with their album artwork "printed" on virtual vinyl records. The full-featured music player sits in the main menu. You can sort tracks by artist, album, genre and rating. The current track's artwork, name, album and artist are displayed in the screen's center while the next and previous tracks are visible at the top and bottom of the screen. Thanks to the built-in accelerometer, the music player automatically switches its orientation from/to landscape mode when you rotate the phone. A very useful feature is the Search option. However, if you have applied some kind of sorting such as album view, for instance, you can only search the album names and not the actual tracks. There are tons of equalizer presets (all non-customizable, though) and among them two managed to impress us. The first is the highly advertised Dolby for Mobile sound enhancement. With Dolby Mobile the sound is richer and more spacious. Bobcat Mobile was also a really nice preset which is best suited for techno tracks. However with all the presets available we're sure you'll find one to suit your tastes. The Arena comes with FM radio and you can use it either through headphones or through the loudspeaker. In either case you've got to have the headphones plugged in as they serve as an antenna. The radio stores up to 50 stations and there is support for receiving two-line radio station info over RDS. Scrolling through stations is very easy and intuitive - you have quick access through the two rows of buttons below the main window. Much like the music player, when the FM radio is running in the background you can control it using the home screen widget. Another nice addition to the LG Arena feature list is the in-built FM transmitter, allowing you to stream wirelessly the currently playing track to any standard FM radio receiver (e.g. car audio or home multimedia system). Naturally a Bluetooth headset is also supported, allowing you to listen to music via stereo Bluetooth earphones. If you don't like the headset that comes in the retail package, you can easily change it for another thanks to the standard 3.5mm audio jack. The LG KM900 Arena has pretty decent audio quality, achieving noteworthy scores on some of the readings in our traditional audio quality test. The handset even manages to slightly outdo the Apple iPod 2G on some criteria and that definitely means something. 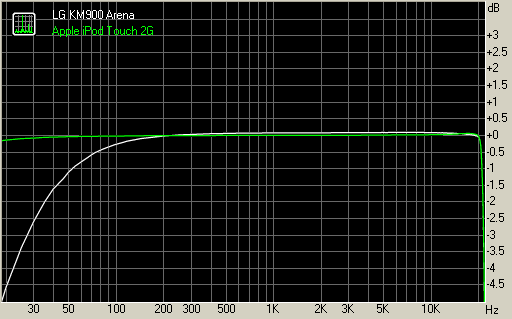 The only notable problem with the Arena audio output is that it has cut-off bass frequencies, probably due to some kind of high-pass filter meant to improve sound on small size headphones. On the positive side the LG KM900 Arena has decent intermodulation distortion and outstanding dynamic range, noise level and low stereo crosstalk readings. The total harmonic distortion extremely low value is also commendable achievement. And here go the results so you can see for yourselves. You can learn more about the whole testing process here.